In an exclusive and unprecedented interview with the Voice of America, Uzbekistan's Deputy Prime Minister Tanzila Narbaeva says that the country's women are the strongest supporters of the current process of reform. President Shavkat Mirziyoyev is actively engaging with women, she says, tasking his government with opening doors to them in every sector while also providing more support to those who remain at home. Narbaeva acknowledged the fact that the Uzbek government, including its Women's Committee (which she leads) has long ignored the issues facing rural women, especially the disabled and vulnerable. She also discussed issues around forced labor and child labor, which she called "two stains on our country." Is Uzbekistan now open to working with groups, such as the Cotton Coalition, that have been critical of its record? Below is the full transcript of Narbaeva's conversation with VOA's Navbahor Imamova, held at the Uzbek Embassy in Washington. 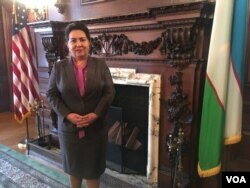 Navbahor Imamova, VOA Uzbek: Tanzila Kamalovna, we are very happy to see you in Washington. You started your US visit in New York, where you attended and spoke at the UN women summit. Here in Washington, you’ve been meeting US officials as well as the representatives of various nongovernmental organizations. What’s this mission about? 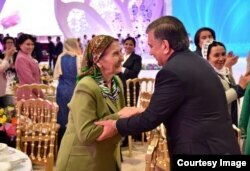 Dep PM Tanzila Narbaeva: That’s right, Navbahor, as you said, we, the Uzbek delegation, have been attending the global women’s conference in New York. It’s amazing to be part of such a huge event, representing our country, and share what we’ve been doing to improve the lives of women in Uzbekistan. As you know, we are carrying out reforms in every sector. These reforms affect every family and every woman in our society. So, it’s an important period for all of us. We heard other UN member states describe their issues, solutions and proposals as regards women. There were discussions about how countries are working to realize the goals they set forward, and also how UN conventions are reflected in reality, and how challenging it is to work on all these complex issues. ... we want to learn from the world's experience. Of course, we outlined the positive changes that Uzbekistan has been witnessing lately, while also talking about challenges, and noted down many interesting ideas and dimensions that we heard from others. Because we want to learn from the world's experience. My colleagues, another female representative, who heads Uzbekistan’s Business Women’s Association, is now attending those UN events, as I am here, and I think it is really important for NGOs like this to participate in these discussions, for them to meet new people and to learn from women from other parts of the world. As we develop a civil society, it is crucial that we benefit from such opportunities. We want to talk about what is happening in our country, and what we are doing to address issues, but we also want to take some things back with us to Uzbekistan and see, if see it can work in our environment. Navbahor Imamova, VOA Uzbek: How did you describe the status of women in Uzbekistan, as you spoke at the 62nd sessions of the Commission on the Status of Women? Dep PM Tanzila Narbaeva: Great question… Because it was such a pleasure to talk about this issue since the attention towards women has incredibly risen in recent years. I don’t know of any other country where the head of Women’s Committee holds a position as a Deputy Prime Minister. You know, if you chair the women’s committee at any level in our system, you have the status of being a deputy to the top administrator in that district, city or region. This is how we are bringing women into leadership roles and increasing their impact. Women actually have always enjoyed deep respect and credibility in Uzbekistan. But most recently, with the adoption of our five-pillar development strategy, we have sealed a new direction to boost our role, political and social input, social care as well as career enhancement and employment. Half of our workforce is made up of women... Employment of women is a crucial task for us. This strategy is not only on paper. On February 2, 2018, our president signed a very important decree, I would say, historic document that opens many new doors for women. It takes into account almost all the modern challenges women face today, and our government is determined to tackle these issues. I did my best to talk about all the aspects of these new policies, but you know, there was not much time to get into every detail. First of all, our government is boosting its support of the family as a vital institution. Women play crucial roles in the development process in every sphere. Half of our workforce is made up of women. And they are not only working in those traditional sectors, such as health care, education or culture. We have many women entering the law and justice system as well as business. We want to make sure they have enough freedom and incentives to prosper in these critical fields. Employment of women is a crucial task for us. We recognize the fact that for a long time we ignored our women, especially those in rural areas, including disabled women, who got very little attention or care from us. We have to be honest about this problem. This new decree by our president outlines this and other issues, and assigns us to specifically focus on these parts of our society. Our task is to go down to the grassroots level, hear our women, seek their input, engage them and work to solve those issues locally, regionally and nationally. Unemployment, low income, educational and health problems, crime and law-enforcement issues - we are determined to approach these problems differently, and hopefully, more effectively. At the UN summit we talked about the integration of women into every sector, and also open new dimensions to development through their unique input. One field that we are really excited about is information technology. There is a San Francisco based project that works with girls via mobile technology. The goal is to make sure that our women, our girls, have access to these opportunities and become active participants in the reform process. Navbahor Imamova, VOA Uzbek: This year’s women’s gathering at the UN focuses on gender equality and empowering rural women. You have been telling me about policy and how the government is approaching these issues. But the reality is much more complex. You know the reality, because you travel across the country and deal with Uzbek women. What in your honest assessment bothers women most? Many tell us that it is the treatment of women. Would you agree with that? Dep PM Tanzila Narbaeva: What treatment? Navbahor Imamova, VOA Uzbek: The way women are treated in general. Many women still feel unequal. They complain of gender-based discrimination and gender-based abuse. Dep PM Tanzila Narbaeva: In some ways, I would say that they are right. Especially our women in rural places, remote villages and communities, face such realities and again, we have to look at the situation as it is, and say that we ignored these parts of our society for a long time. My own organization, the Women’s Committee, limited itself with women in urban areas. Rural women did not have an opportunity to attend our seminars, workshops and conferences. Most of the women had no access to us. ... we ignored these parts of our society for a long time. Last year, as you know, was the year of dialogue with our people. We actively sought to connect with our women and can tell you that we reached out to those women in remote areas, and we are determined to always maintain this engagement. As a leader, I learned for myself that you don’t know the issue and cannot solve it unless you come down and hear the people. We understand the issues better. The problem is clearer, and it gets easier to work on solutions, and work on a new strategy and programs to improve the lives of our people. We did not function like this before. I worked at the Cabinet for many years. The tradition of naming a year started in 1992. All the programs would be written at the Cabinet. We would bring in some experts, and then this or that ministry would shape the program. Now it is very different. Our president does not want the same thing. The same thing cannot be applied to every part of the country. Every district and region has its own specific issues, and they deserve a unique focus. So we work with the people and for the people, as the president says. I would say that our eyes are wide open now, as we tackle any issue. Engaging the community, studying the problems at the root, get the local input – these are integral parts of our work now. This is new for us. Again, I credit the president for it. Now that this is becoming a routine, we cannot go back. You know, right before this visit, I was touring some districts. We take a district that has the worst numbers in terms of everything, and work with it. Unemployment, lack of infrastructure, lack of gas and water… We work with the local budget. We focus on fundamental issues and brainstorm about how we, including the president, can change the reality. I should say that we get all the support we need from our leader. What you said is true. But things are changing now. I don’t think there is a woman in Uzbekistan, who for the past one year, has not felt the effect of reforms. I’m sure she feels them and that her family is benefiting from them. I have visited many women, in hundreds of visits, knocking on people’s doors, asking about what they are struggling with. This is the way we do it now. It is painful to see women struggling. We don’t want to live in a country where women are poor, where women choose criminal ways to feed their family. Because women are our future. Because they are our honor and lifeline. Every community leadership now has a list of women who need support - abused, unemployed, left without income due to various reasons, for example, her husband is abroad. We assign people to work with them. They are in charge of providing social care, mental and health care. We have been developing such services. Navbahor Imamova, VOA Uzbek: As you say, women are half of the Uzbek society. What if there are women out there who have not heard of such things you are talking about? Can they reach out to you? Can they seek help themselves? Dep PM Tanzila Narbaeva: Of course, they can. I want them to. Dep PM Tanzila Narbaeva: (laughs) Well, there is a reason why I’m the Deputy Prime Minister. Yes, my work has two dimensions. I’m in charge of serving the interests of women. And as the deputy, my job is to identify problems and work to solve them. That means I raise them with relevant officials and push for change. Navbahor Imamova, VOA Uzbek: You have the power to do that? Dep PM Tanzila Narbaeva: Yes, I have that kind of power. If you chair the women’s committee at any level, you can raise the issue with the relevant authorities. You have got that power. In my position, I can assign any ministry to look into a problem and ask why things are not working the way they should. I can do that in regards to issues that women are struggling with. You are right, my job is the hardest in many ways. In Uzbek we say, we push a cart with a very heavy weight. Its wheels have to be solid. I want to do that by having the best expertise. We need skilled, capable people working for us. ... we push a cart with a very heavy weight. Its wheels have to be solid. I want to do that by having the best expertise. We need skilled, capable people working for us. We are the biggest nation in Central Asia with more than 32 million people. We don’t have enough staffers even when we increase the number to 100-200 people. We need to strengthen our local activities. The Women’s Committees need to have a grassroots presence and we need those efforts to be managed by really capable local women, who understand and handle issues such as employment, health, education, culture, sports, etc. We want to send our women abroad for experience and exposure. 48 percent of our workforce is women. We must work with labor unions and rely on them. I led our country’s labor union for a long time, and I know the issues. I know what is there in those agreements with the state. I know we included several parts that specifically guarantee protections and incentives for female employees. We need to make sure those things are provided. There should not be a gender gap in pay. I can tell you that we don’t have that problem in Uzbekistan. At the UN, I hear that many countries suffer from this problem. Our laws and bylaws do not allow that. Navbahor Imamova, VOA Uzbek: Worldwide, women make 23 percent less than men. Are you saying that women in Uzbekistan get equal pay? Dep PM Tanzila Narbaeva: Yes, they do. Our laws guarantee that and we make sure it’s reflected in reality too. We don’t even have that notion – unequal pay for equal work, at least when it comes to gender. Women in some cases make more because of those incentives and agreements that I was just talking about. There is another aspect though. We don’t have many women doing the same kind of work as men. But we want to change that. This year’s new decree, and the ministry for preschool education are the kinds of steps we are taking to open ways for women to enter any field they want to be in. We used to have a female economy minister. She is in the President’s Office now. We have a woman deputy prime minister. This is progress. But we don’t see this as a gender gap in Uzbekistan. It’s a process, you know. We have women senators, lawmakers, and we need more of them. I want our Women’s Committee to work really hard to make sure that more women are candidates in the upcoming parliamentary elections. 30 percent of the Oliy Majlis, our parliament, is reserved for women. So we should have a reserve of female politicians capable of competing with men in getting those positions. Uzbek women are very capable and we need to get more of them into leadership and management positions. I believe that we can and we will. 30 percent of the Oliy Majlis, our parliament, is reserved for women. So we should have a reserve of female politicians capable of competing with men in getting those positions. Uzbek women are very capable and we need to get more of them into leadership and management positions. I believe that we can and we will. Navbahor Imamova, VOA Uzbek: So if you are a woman with a strong will and the ability to lead, the door is open? Is it possible to make it to the top? Dep PM Tanzila Narbaeva: Yes, it is. I’m very open about this. The thing is, in Uzbekistan, women, no matter how strong they are, they give way to men. Women prefer to lean on them. Women must get to those power positions because they can and want to, and not because they are women. If you believe in yourself, have that the knowledge and experience, and if your family is okay with that, if you and your husband have worked it out, why not. The opportunity is there. Navbahor Imamova, VOA Uzbek: As Uzbekistan reforms itself, as you say, the country needs its women and men equally. Dep PM Tanzila Narbaeva: Absolutely, we cannot leave these complex processes to men only. But we can contribute in so many ways. You don’t have to be in those high positions. Actually, our women, I would argue, do not usually prefer those positions. They want to be close to their family, work nearby, and spend more time with their children and loved ones. The government respects that. Women have a right to choose. That is why we can’t join the calls of international organizations who say that say women must be there or must be here. Because we want women to choose what they want to do. Our women choose their families. That’s the traditional way of life. Every country has its own context. Look at me, look at you – we are doing what we are doing because we chose so and because our families supported that. Not all women have that. And many women, again, don’t want this. What we have to do is to make sure our women have opportunities to grow wherever they are. Let them be able to work from home. Let them be able to have their own enterprise or manufacturing business. Let them be able to thrive in the fields that they choose. Navbahor Imamova, VOA Uzbek: You are referring to the Uzbek mentality… Forced labor is still a hot topic - a critical issue whenever Uzbekistan is discussed. I’m sure you are seeing this in your meetings and discussions in Washington. 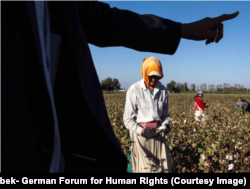 For a long time, the Uzbek government refused to call it for what it is, trying to justify it as a “national contribution during the cotton-picking season” or “volunteering.” But now the government has changed its position, acknowledging the problem of forced labor in the country. This has been applauded. Your position has been that child labor is eradicated but that for getting rid of forced labor there is a long way to go. What are the barriers to achieving this? Dep PM Tanzila Narbaeva: Child labor and forced labor… Two stains on our country. This was, indeed a stain. The International Labor Organization (ILO) started to put it on the agenda in 2008. When I attended a conference in Geneva in 2012, no one wanted to speak with us. The perception was that we were this horrible country exploiting kids, closing schools, workplaces and forcing everyone to pick cotton. It was true so some extent, but not quite accurate. People who held such perception ignored our history, our Soviet past, which put this burden on us. We had to produce cotton. We struggled to end this practice. It was very difficult for us to set up a new system based on mechanization. We chose to do this step by step. But then we struggled to deal with the process, facing endless challenges in the market economy we wanted to build. Child labor and forced labor… Two stains on our country. In 2008 Uzbekistan ratified two UN conventions. Our current president, Shavkat Mirziyoyev, was prime minister at the time. He took this matter very seriously, and we started engaging the ILO. I was a part of the coordination council which mission was to tackle child labor. 17 ministries and entities worked together with the goal of ending this practice. In 2013, the ILO reported that the child labor had ended in Uzbekistan, but they cautioned us about several risks and threats, which were well founded. The ILO gave us recommendations. We realized that our entire system and society needed to be retrained and educated about what constitutes child labor and forced labor. We lacked awareness of international norms, especially international labor standards. So we started to work on these issues. We created new educational materials and coursework to make sure that everyone involved got this training. I became a trainer myself. I worked with labor unions, the Ministry of Labor, and trained officials and others on how to respect our laws, rights, and adhere to international norms. First of all, we needed to change the mindset of our people. People would say: so what if our kids are working, picking cotton? People would not see it as a forced labor. Many claimed they were not forcing kids to do the work. So we do not deny that we had a child labor problem. It is true that schools and colleges had to send students to pick cotton. But starting in 2013, with our Prime Minister’s leadership, we ended this practice. The ILO has been reporting about this almost every year since. Navbahor Imamova, VOA Uzbek: What happens when kids are still forced to pick or basically work? Dep PM Tanzila Narbaeva: We hold people responsible for it. There is a good system in place now which deals with such violations. Where were the parents? Where is school in this? Who forced these kids to work? You know, what I’m hearing here in Washington and also at the UN in New York are congratulations and warm words about what we have been doing at home. Everyone welcomes these changes. These are painful issues for us, and we are working on them. The world is taking notice. I think our president’s speech at the UN last year really reflected our approach. The ILO is our partner. We will continue to work with them closely. After the UN speech, the president ordered us to fully control the process to make sure no forced labor is allowed. We want to eventually remove this issue from our agenda because it should no longer be an issue, which means we want to fully put a stop to forced labor. We are launching a cluster-method in our cotton production. Every region will adopt this. The whole process is handled by the farmer who is a businessman or businesswoman. He or she makes all the decisions, starting from planting to what to do with the end product. Navbahor Imamova, VOA Uzbek: What guarantees do you have that this person will not rely on forced labor? Dep PM Tanzila Narbaeva: There is no room for forced labor. This system is already underway in the Navoi Region. The labor hiring process is modern, based on international standards, compatible salary, employment contracts, and good working conditions. Navbahor Imamova, VOA Uzbek: And they offer seasonal jobs? Dep PM Tanzila Narbaeva: Yes, seasonal jobs are in demand. Unemployment is Uzbekistan’s number one problem. We want to provide jobs, and seasonal jobs are good too. Whether picking cotton or fruits and vegetables, we want to make sure people get paid and are treated fairly. We want to protect the laborer. We want a system that is easier for both the employer and the employee. This means we need to educate people about the process. Awareness is key. As I travel around the country, I see everyone at work, but many people working in the fields and in various businesses have no paper to prove that they are employed or that they have rights and obligations. They have no contract, especially women. Recently in the Rishton district I saw women working in a pottery shop, and I asked whether they had an “employment book.” They didn’t. They are part of the informal economy. This is something we must change. Documentation is necessary. We want to create jobs, including home-based jobs, family-based businesses, and for any job there should be a contract and a paper proving it. Or else we will not become a system that adheres to international norms and standards. Navbahor Imamova, VOA Uzbek: Now, you know that there are many critics. 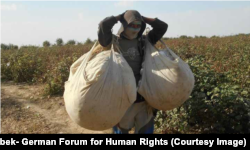 The Cotton Campaign is an international coalition to end forced labor in Uzbekistan. They recognize that there is progress in the country but they still see deep problems. So does Human Rights Watch. We know you are talking to them. Do you see them as potential partners or can they be your partners? Dep PM Tanzila Narbaeva: These international organizations used to say only negative things about Uzbekistan. By working with the ILO, we showed that we can cooperate with international organizations. As I said, in 2012 when I went to a meeting in Geneva, no one wanted to speak with us. We were a problem-country. But we started talks, invited them over, studied the issue together, went through our programs and reviewed them together with the ILO. This kind of engagement worked. We achieved something together. Navbahor Imamova, VOA Uzbek: By building trust? Dep PM Tanzila Narbaeva: Yes, and that is why I say to them, whether it is Human Rights Watch or Cotton Campaign, both of which I met yesterday, we are open to their input. I’m glad to hear positive feedback from them. Perhaps they struggled to understand us. Perhaps they did not have solid sources. They based their conclusions on limited sources. But we need to hear them. These organizations have some good aspects. We need to inform them about what we are doing, our strategy, our programs, and our priorities. We also could take their points into account and see perhaps where we can correct some things. Navbahor Imamova, VOA Uzbek: The Cotton Campaign wants there to be independent monitoring. They question your statements. Dep PM Tanzila Narbaeva: Well, we are becoming more and more transparent. The annual monitoring is not done by the government, but by a coordination council. It includes labor unions and NGOs. The World Bank is also a part of it now. But these organizations want a different kind of monitoring. I don’t agree with that approach. Monitoring requires deep knowledge and expertise. There is a certain methodology. Not just anyone can do the monitoring. For us, the ILO is the most credible and capable organization to do this job. We trust them. They are constructive. They point out our shortcomings and help us to overcome them, by providing useful recommendations. They are helping us to end forced labor. During last few years we have seen some progress. This is due to our own reforms in agriculture and economy, led by our president, and secondly due to the nongovernmental support we have gotten. Thirdly, this is due to the cooperation we have been able to foster with the ILO. For us, the ILO is the most credible and capable organization... We trust them. They are constructive. That is why we say that if you want to help us by being constructive, offering the right direction, we will accept your suggestions. Human Rights Watch has been visiting Uzbekistan. We talk with them. We want to work with them. Cotton Campaign also wants to come to Uzbekistan. They are welcome. We will show them what we are doing. If they have well-rounded proposals that we like, then we will work on them together. Navbahor Imamova, VOA Uzbek: So, you are opening the door for cooperation with them? Dep PM Tanzila Narbaeva: We are telling them that we respect their opinion and findings and will consider their recommendations if we find they fit. We will find this out as we talk, exchange views and discuss. I think they get it. They understand that. Navbahor Imamova, VOA Uzbek: The Cotton Campaign has been pressuring Uzbekistan for a few years now. In many ways, they could consider the progress in Uzbekistan as their success too, no? The pressure worked, they may say. No outside group can change the reality if you don’t have the government’s will. So, I credit our president. But we recognize that these groups have had some impact. Dep PM Tanzila Narbaeva: No, I would not agree with that. Uzbekistan was criticized before they emerged, and most importantly, there is progress because Uzbekistan is moving forward. Any success in the country is based on what the people want and how much effort they put into it. To me, the progress is due, first of all, to our new policy. We are working on these issues one by one, step by step. Then we have partners, supporting us. No outside group can change the reality if you don’t have the government’s will. So, I credit our president. But we recognize that these groups have had some impact. Navbahor Imamova, VOA Uzbek: Speaking of changes, what we saw at the celebration of 8th of March, International Women’s Day, was interesting. This day has always been celebrated as the day of feminine beauty and elegance. But this year President Mirziyoyev made a special address to women, discussing deep socio-political issues, pointing out their role and duty as the citizens of Uzbekistan, while also praising their contribution. Do you see this approach as something new too? You have been in the system long enough to notice. The president seemed to be challenging the women of the country with this speech. Dep PM Tanzila Narbaeva: Yes, he did. First of all, he acknowledged women’s economic input. There can be no social and economic progress without their contribution. That had to be recognized. Our president has been engaging with women since day one. Wherever he goes, and no matter how urgent the matters are, he always makes sure to talk to women, ask about their issues and hear them out. He has been quite critical of our organization too, because we were not good at engaging with the women around the country, especially rural women. His 8th of March speech made us feel proud. You are right, he did not just say “oh, you are beautiful,” “oh, you are a mother,” “oh, you are the best.” He praised us but also reminded us that we must be a part of this reform process. He called upon us. 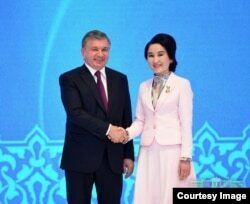 President Mirziyoyev with Zulfiya award recipient, Tashkent, March 7, 2018. Zulfiya is a state award given to girls for success and contribution in science, arts and sports. Usually the 8th of March was the day when we felt like a woman. Now we feel that pride and duty every day. We are the citizens that the country needs. Our president speaks to mothers and young women to remind us of this. He wants women’s input. And people are responding very positively. I think the most support for him also comes from women. Our Zulfiya award used to be given to 14 girls. We have doubled the number of awardees now. 38 women have been awarded with “Mo’tabar ayol” medals for their hard work and unique contribution to our development. We not only want to acknowledge those working women, but also those women who are raising kids at home. That is a critical task for all of us, for the future of our society. [President] praised us but also reminded us that we must be a part of this reform process. He called upon us... We are the citizens that the country needs. New kindergartens, new initiatives to help young women to enter the workforce and make careers – these are very important steps. Mothers with 2-3 children should not get stuck at home because they have no access to child care. They should feel encouraged to work, especially if they have the knowledge and training. Many women at the age of 30-35 struggle to get back to work because they feel like their skills are outdated by the time they can work again. We are creating conditions for these women to prosper. Housing, mortgage and loan programs are very significant steps too. We have many households where 4-5 families live under one roof. This makes women’s lives especially difficult. We want to prevent family conflicts as well as divorces. Housing, in our view, would help us resolve some of those domestic issues. Every family should have an opportunity to grow, to increase its income, and get stronger economically. Young families should not be dependent on their parents. They should be able to lead independent lives. Again, all these aspects affect the lives of women very deeply. Navbahor Imamova, VOA Uzbek: Housing is indeed a very painful issue for many in Uzbekistan. As the government comes up with these programs and puts them to work, I go back to that question: Are women a part of the decision-making process? As the head of the Women’s Committee, my mission is to boost women’s participation in the political process. In Washington and in New York, I’ve been meeting woman after woman. I feel like this is a female-dominated society. Women are in charge. Not because they are women but because they can. They are capable. Dep PM Tanzila Narbaeva: Yes, we are. We don’t have to discuss these issues in the office. We can involve women in their communities, in their fields, and where they face the issue. Our dialogue with our people is based on that goal. We want to get out of the usual bureaucratic ways of doing things and seek people’s input where they live and work. Navbahor Imamova, VOA Uzbek: In many government meetings, you are the only woman sitting among many men. I remember watching the big meeting on national security, and thinking about this… What is it like to be that, that one female in the room? Uzbekistan is such a male-dominated system – male sultanate! Dep PM Tanzila Narbaeva: (laughs) First of all, you know, Uzbek women are very dedicated. Just because we have few women in power does not mean that we are incapable. I know there are many women out there more capable than me. They have reasons to be somewhere else. As the head of the Women’s Committee, my mission is to boost women’s participation in the political process. In Washington and in New York, I’ve been meeting woman after woman. I feel like this is a female-dominated society. Women are in charge. Not because they are women but because they can. They are capable. Navbahor Imamova, VOA Uzbek: So you are comfortable sitting with 20 or so other men in a meeting, expressing your opinion, pushing ideas and giving feedback. Dep PM Tanzila Narbaeva: I don’t find it difficult. They listen to me and they listen with respect. They say “let’s ask our sister.” They answer me as they answer with the same level of respect towards their mothers, their older or younger sisters. I know other women say the same thing. We may be a male sultanate but men dominate while holding us in high regard, I would say. Navbahor Imamova, VOA Uzbek: Thank you for talking to us! Dep PM Tanzila Narbaeva: Thank you too! Should Uzbeks in America be worried? Is Mirziyoyev coming to Washington?